Sommelier Vanessa Trevino Boyd & Chef Fritz Gitschner are planning a special evening for Houston wine lovers. 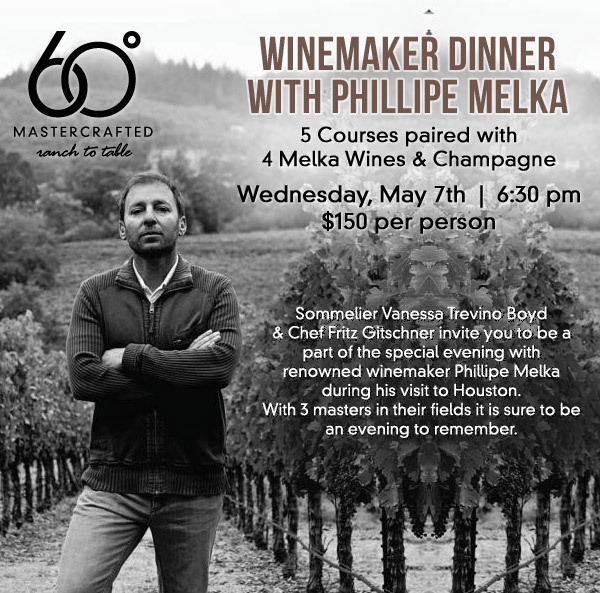 Their 60 Degrees MasterCrafted is hosting a special evening with California winemaker Philippe Melka on May 7, 2014. Robert Parker named Bordeaux-bred, winemaker Philippe Melka , one of the world’s top nine consulting winemakers. Philippe refined his wine-making skills at Châteaux Haut-Brion, Petrus & Cheval Blanc in Bordeaux. He incorporated those old-world skills into his work at Dominus, Bryant Family, Dalla Valle and Quintessa over the past 15-plus years. More recently, Philippe, along with his wife Cherie, has crafted his own award-winning wines under the Melka label since 1995. The 5-course dinner featuring renowned Akaushi beef paired with 4 Melka wines and a Champagne welcome will take place May 7th. Cost is $150 per person, and dinner will commence at 6:30pm. Click here for reservations.